People always ask what the tattoos mean. That is when people are slightly more comfortable with me. Those who are very comfortable with me, those who know me well, either smirk knowingly or smirk condescendingly. Because, no matter how you look at the ink, it seems that I have commemorated my fanfiction in them. I just gave up teaching at the university then, the profession that was chosen for me by my parents and by the societal expectations of Russia at the end of 1990s. And I was just starting to write my fanfiction. And I saw the most wonderful necklace in a shop, a tree, in silver, made by a wonderful talented Winnipeg based artist. “Oak?” I gasped. I didn’t even realise. It was cute though, I thought then. Oak as in Oakenshield, as in Tolkien’s character. My favourite, since I was six. I had been very fond of the old grumpy Dwarf, and later, with a certain measure of embarrassment also very fond of the blue eyed hunk in Peter Jackson’s films. By then I had written a few stories with my OC named Wren and Thorin, and while the tattooist was creating the lines on my skin, I smiled. 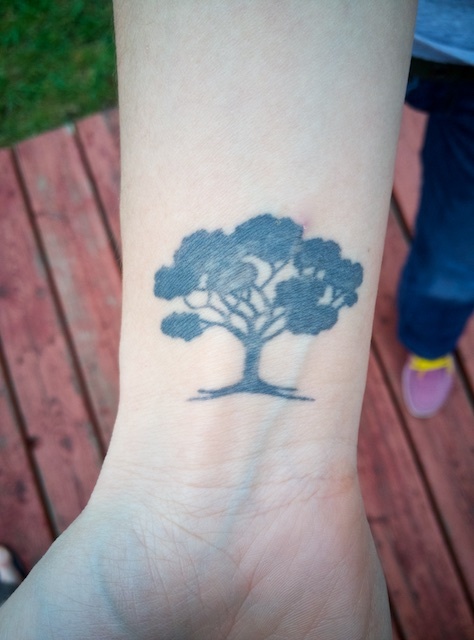 “Is it the tree of life?” I am always asked. And I nod. Of course it is. It is my tree of life. The life that I finally live, the life that is full of choices I make myself, the life where writing takes a lot of space, and where Thorin Oakenshield became an inspiration for John Greaves, the protagonist of my first novel Convince Me the Winter is Over. It was my 32nd birthday, and I once again went into Rebel Waltz Tattoo, and sat in that chair. It was a different artist, and he didn’t tell me anything about being an arborist, but I didn’t ask. By then I was working in my bakery and was mostly concerned with the heat and how my birdie would heal. “I want a wren on a wire,” I said, and he stared at me. He googled wrens, and we debated the design for an hour. Wren on a wire. My wonderful friend Erin suggested it as a title for a novel, and I was in love. Its half alliteration, the song of my beloved Leonard Cohen it reminded me of, the simplicity of it, – all of it was perfect for that second novel I was writing, and I thanked her. She only claimed bragging rights, and she gets all of them. Now, when asked, I say the bird is a symbol. If I know the person a bit better, I explain that Wren on a Wire is the title of the novel I’m working on right now. 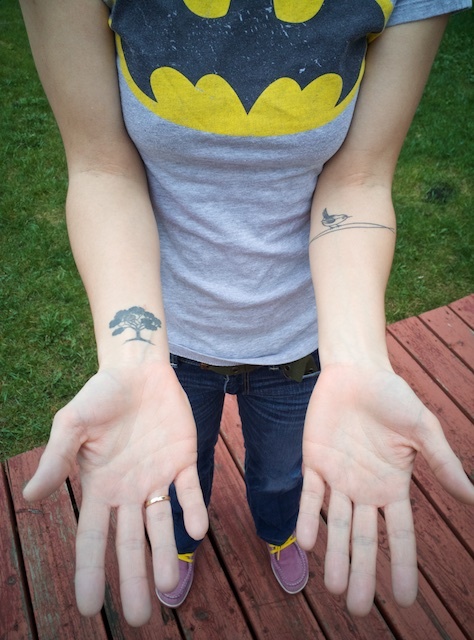 So, no, these are not fandom tattoos, and I’m not mad enough to ink my fanfiction characters into my skin. 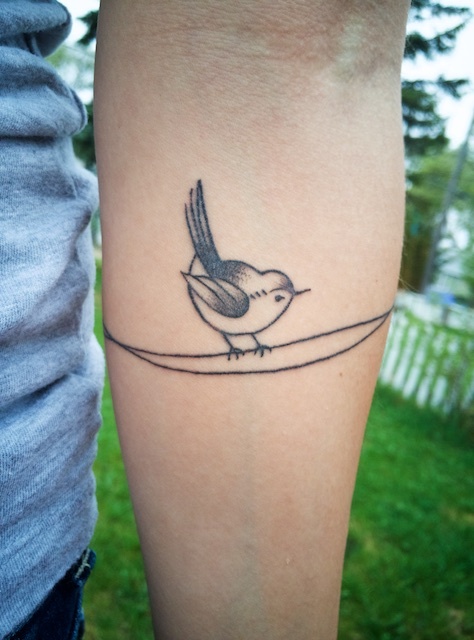 And yes, Wren is that important for me that there could have been no other bird to sit on a branch or a wire for me to remember that I need to believe in myself. What a great first entry!! I love tattoos and their meanings!! And I love the book title. John Greaves is also the perfect character name!! Thank you, Meg! Remember, I am dedicating the book to you. And Andrey as well 🙂 but it wouldn’t have happened without you. I just followed the link to this page from your fanfiction page. I am working my way through all of them and am loving each of them but I will admit that I do love your portrayal of Thorin. I love your tattoos. I have a celtic cross which means so much to me. I hope to keep on reading your work for a long time. A celtic cross sounds so wonderful! I find them exceptionally beautiful. I just felt as a non Celt I would be presumptuous to put it on me, but I was tempted! They are exquisite and carry so much meaning! Oh Jill, that is such a beautiful quote, and I am not at all surprised that we have such similar favourite quotes! As my most loyal and beloved reader you are a kindred soul indeed!